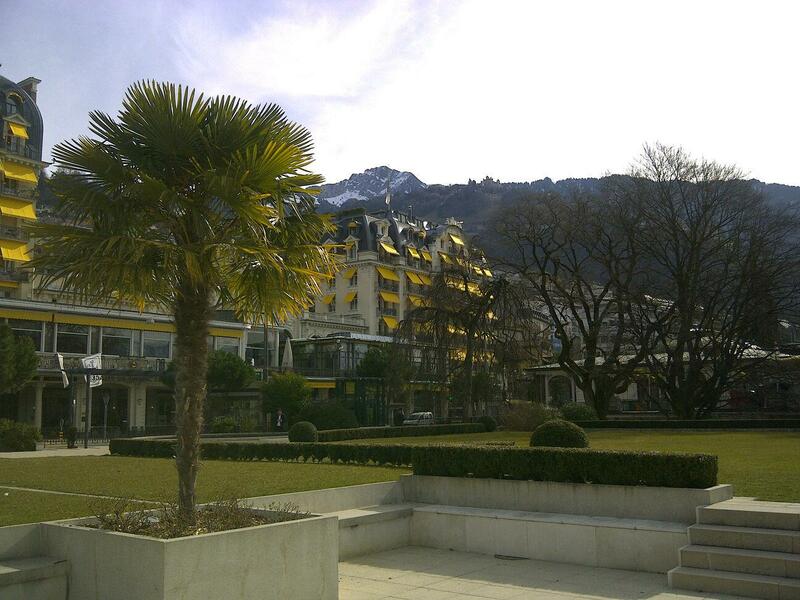 Greetings from Montreux, Switzerland, on the shores of Lake Geneva. There aren’t many places where palm trees are framed by snow-capped mountains. Heck, even I managed to take a decent photo. Nation’s banking system is corrupt as heck. Nation is not laudable in any feature. It’s history is littered with financial and political corruption. Neutrality is just a black code word for immoral appeasement , which encourages and supports African and Chinese embezzlement. As a result, this nation’s disregard for the inclusion of moral scrutinizing in financial matters severely weakens its Western neighbor’s promotion of human rights and justice. Creating affluence and stability at the cost of your soul Mr. Switzerland significantly hinders the safety of your neighbors. The spirit of the Christ abhors you in my eyes. I hope dots will be put together and the attack of the Russian’s in Ukraine will expand into Switzerland. Cleans the West of that dirty, nasty, inhumane, best of a nation. Me again. Here to throw another tuppence. I’ve heard once that Switzerland, as well as some other European countries, actually has a higher average life span than that of the US (the highest life expectancy in the US is Hawaii’s 81.3 years, and the closest two European countries in that regard are the UK and Ireland, with Switzerland having a much higher one), even though they smoke and drink more. How is this possible? Do the damaging effects of junk food and car pollution outweigh those of tobacco or alcohol? P.S. Which part of Switzerland did you travel to? Sprechen sie Deutsch? Parlez-vous Français? Seriously, what do you have against soccer? Sure, everyone else will be crazy about it, but deep down, it’s just a simple sport. If you don’t like it, don’t participate in it. No-one is forcing you to. I sincerely hope you don’t consider this as “Spam”.. my patriotic impulses lead me to believe that it is necessary to bring the American people “Under One Banner” in an effort to restore constitutional government to these once united states. I am here obviously because we have similar feelings towards Switzerland and the U.S. In other words, the Swiss see guns as a means to PROTECT their country. That’s not why people in the US have guns. In Switzerland, all military ammunition must be stored in central arsenals rather than in soldiers’ homes. One of the reasons the crime rate in Switzerland is low despite the prevalence of weapons — and also why the Swiss mentality can’t be transposed to the current American reality — is the culture of responsibility and safety that is anchored in society and passed from generation to generation. Durrrr, soccer bad go Dawgs, durrrrrr. Dipshit. The reason all males have a gun is because they are required to take it home from the military. Also, I read that they are no longer allowed to take home ammunition. I am an American and have lived in Switzerland for 20 years. I agree with the author’s reasons for wanting to stay in the U.S., especially since it is cold, gloomy or rainy about 10 months of the year! However, as someone opposed to relaxed gun controls, let me point out that not every male owns a gun in Switzerland. Only Swiss citizens, male or female, who have served in the Swiss Army ( which is still mandatory), have guns, but they are only issued bullets when on active duty. Other Swiss or non-Swiss may have weapons, but I just want to set the record straight that not every man, because he lives in CH, automatically gets a gun. All it takes takes is for Russia or China is to launch just ONE single EMP bomb and most of Switzerland will be back to the 1800s with modern day populations to feed. Heck even a major solar flare will wipe out most of the grid since the grid relies on circuit boards which will be shot. If you can’t stomach the weather we have, better stay out. Else, you’re welcome. Reason Number Six for living in Switzerland. Barack Obama is not their President!! You do realize that Switzerland does not have a standing army, instead opting for a people’s militia for its national defense. Every able bodied man between the ages of 20 and 30 are conscripted into the militia and undergo military training, including weapons training. The personal weapons of the militia are kept at home as part of the military obligations; Switzerland thus has one of the highest militia gun ownership rates in the world. In October 2007, the Swiss Federal Council decided that the distribution of ammunition to soldiers shall stop and that all previously issued ammo shall be returned. By March 2011, more than 99% of the ammo has been received. Only special rapid deployment units and the military police still have ammunition stored at home today. So, while there may be guns in most houses, there is no ammunition with the guns. The sale of ammunition is subsidized by the Swiss government and made available at the many shooting ranges patronized by both private citizens and members of the militia. There is a regulatory requirement that ammunition sold at ranges must be used there. you forgot the sixth reason why Switzerland is better than the US. They offer free education as well. You know socialism. You right wingers kill me. Before deciding on a new constitution a while back, the Swiss studied the US system, used the best parts, and revised the others. So the Swiss system is more or less an updated version of the US federal constitution with more of the benefits and very few drawbacks. Frances Kendall and Leon Louw (see the FMF at http://www.freemarketfoundation.com) wrote a book about the Swiss system called: South Africa, the Solution. They were twice nominated for the Nobel Peace Prize for their outstanding efforts. The system they propose would form a brilliant solution to the current European Union problems. But would any European politicians allow the benefits of prosperity and limited government to override the loss of centralized power that they all seem to be both pursuing and yet trying to avoid? See this International Society for Individual Liberty pamphlet…. Switzerland was voted the cleanest and the most beautiful country in the world . But Switzerland is overrun with those Socialist Trains!! (well, the Tea Partiers THINK they are socialist! How do you explain this inconsistency with the U.S. “conservatives” who don’t get WHY the Swiss love their trains? Posting 3 comments is an abuse, but I absolutely must correct a mistake: I meant that National SOCIALIST Germany -a dictatorship, therefore it DOES WAGE war- could not conquer SWITZERLAND. Democratic Germany -a democracy, therefore it DOES NOT wage war on another democracy- is then much less likely to conquer Switzerland than the brutal & murderous Nazi dictatorship. In the USA the people cannot limit -with referendums- the power of the federal government while in many US states the people can limit -with referendums- the power of the state political class. So it is not surprising that most of the oppression in the USA comes from the not limited by referendum federal government; Look how Mr Mitchell signals that in the USA 2/3 of government spending -the amount of government spending is a good measure of the level of oppressive power that the political class has- comes from Washington (the US federal government). But in Switzerland only 1/3 of spending comes from the limited by referendum swiss federal government. Isn’t that kinda relative? Like working on Wall Street earns you the kind of money you need to have an office in Manhattan? I figured the same would apply here. In that anyone worth their salt would be able to support themselves almost anywhere. Well that is, anywhere they are not being screwed by oppressive taxation and/or rules. And isn’t this the exact point we Libertarians are trying to make? That the situation of the so-called “poor” in a Free Market environment, is not the same as the plight of plebes under an oppressive state system? Mr Zorba: Many western european countries excel at having a political class that enslaves the people. They used to call it monarchy and now they call it socialism but in both cases a political class has insane power and turns people into its serfs. Dictatorship is the cause of war because democracies never wage war among themselves. If the ultra murderous national SOCIALIST Germany could never conquer Germany then the current democratic Germany is even less capable of conquering Switzerland. The left has been selling lies for milleniums: It is pretty clear that communism was the political class sadistically murdering and robbing the owners of capital and enslaving everybody else but mainstream academia and media are so corrupt that they succesfully sold the lie that “the people” wanted the bolshevik mass murders, that “the people” wanted the european tax hells, etc, etc. But it is pretty clear that “the people”, when it has power, chooses capitalism, freedom and be a tax haven like the USA and Switzerland which, according to Mr. Mitchell, are the biggest tax havens in the world. Switzerland is surrounded by a hostile neighbor, the EU, who increasingly hates the Swiss not for what they do (they don’t bother anyone) but for who they are. I.e. a people freer than their EU counterparts who, in fine European collectivist tradition, have self-imposed on themselves mandated homogenizing, innovation stifling, participation into communal causes. By contrast, with much less collectivist burden, the Swiss people do have incentives to exceptional work (and exceptional work they do indeed) and thus enjoy a more vibrant economy, while the EU is well on its way to worldwide economic marginalization. As the EU declines economically under the relentless compounding of endemic low personal incentives to excel and resultant sub par growth (1.5% vs. 4.5 for the world average), Europeans are likely to turn increasingly hostile and nasty towards their more successful and prosperous Swiss neighbors (declining empires tend to turn nasty in their death throws). Switzerland is now becoming a thorn on Europe’s side, a blatant counter-example to the European collectivist culture of redistribution and central planning. As the European culture of mandated compassion and central planning ironically leads to the cruel outcome of economic decline, under the relentless compounding of slow growth, Europe is bound to become ever more hostile towards its successful independent and freer neighbor. If you have any doubts about the pressures Europe will apply to Switzerland look at the French “Competitiveness Pact” (no seriously that is what they called it) pushed on Ireland now that Europe managed to get Ireland under its thumb. The “French competitiveness pact” for Ireland and the rest of Europe is: “Increase Your Taxes”, presented, advertized and imposed with a straight face by a majority of French people through their elected president Mr. Sarkozy. (*) I guess you can call it a competitiveness pact. They are competing who will manage to marginalize their economy faster in a world which growing at a 4.5% average is leaving Europe, growing at 1.5% average by an additional 3% points every year. While the road to innovation stagnation is paved with central planning. Interesting post. I’ve heard lots of good stuff about Switzerland from the decentralization to the skiing to the banking policies. According to the report NH, SD and CO tend to be the freest parts of the US. As for weapons laws, they tend to be far more liberalized in the US than any other Western nation, including Switzerland. Heck, NH has far more liberal weapons laws. For example, the only state law applying to knifes that I know of is a prohibition on felons from owning them. The firearms laws in NH, MT, WY, AK, ME, VT, ID and other states are also far more liberal than in Switzerland. In NH, a 14 year old can legally strap a pistol on their waist and walk around town, even go inside the police station or a church. As for decentralization and voting on issues, I agree that Switzerland is way ahead of most US states. However, NH has a lower legislative chamber, the General Court, with 400 representatives. That is one for every 3000+ people in NH. Additionally, in the vast majority of towns, the voters vote on many issues, issue by issue. In my opinion the Swiss confederation remained a true federal state because almost any law can be repealed by the people on referendum. The founding fathers of the american democracy feared too much the power of the people and because of that in the USA the political class is the one that makes the federal laws: The small colony -the USA- that became the world superpower at extreme speed in the 1800s with around 10% total government spending now has been turned, by the political class, into an european stagnated welfare state. US total government spending is around 40% of GDP and it is difficult to bring it down and it is crystal clear how government spending slows growth. I see your patriotic impulses and american exceptionalism belief in your continuous bashing of soccer.